Please see the notes below about the source of these numbers. That big bump in 2008 is the Alexander on Washington Ave. These numbers are collected and published by the Census Bureau, where you can download them. But the Capital District Regional Planning Commission also does that and makes them easier to view in a bunch of sortable tables and charts. We've scooped up numbers from the Census and CDRPC. There are a few more charts at the top large format -- click or scroll all the way up. One of the things that jumps out in looking at the split between single-family units and multi-family units since 1980 is the relatively small number of new single-family homes built during the 2010s compared to the previous decades. That's helped shift the overall mix of new units toward multi-family. 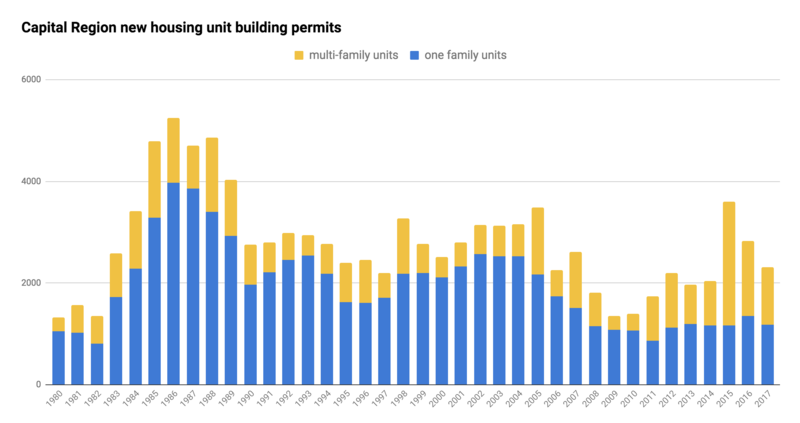 In fact, there were more multi-family units permitted in 2015 and 2016 than single-family units, which hadn't happened going back as far as 1980. In 2017 single-family edged ahead again, but only with 51 percent of the overall units. 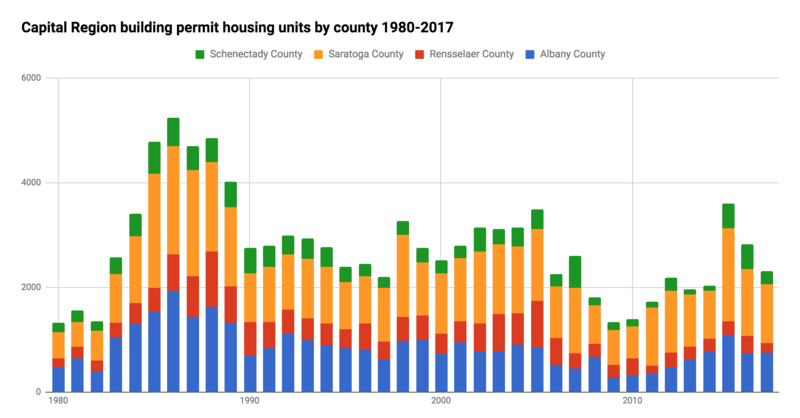 Municipalities in Saratoga and Albany counties have both issued the most number of building permits for housing units -- by far -- going back to 1980. That's been especially true in the 2010s -- thanks mostly to Saratoga County. But Schenectady County has been picking things up a bit the last three years, adding a bunch of multi-family units in Schenectady (395), Rotterdam (269), Niskayuna (187). CDRPC has a few good graphs related to the top 10. 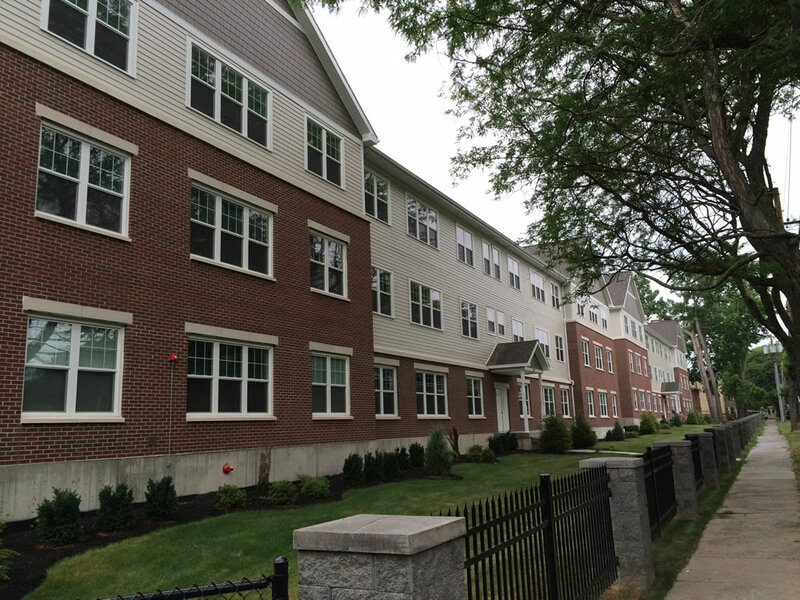 It's also notable that even though the top 5 include lots of suburban areas, the municipalities have been adding significant amounts of multi-family units, which is maybe a little surprising (except in the case of Saratoga Springs). The Elefteria on South Allen, one of a handful of new or planned apartment buildings in the city Albany during the past few years. The city of Albany just missed out on being in that since-2007 top 5 -- it was #6 with 1,135 units, 902 of them multi-family. And it ranked #2 overall for most number of multi-family units added, behind only Saratoga Springs. 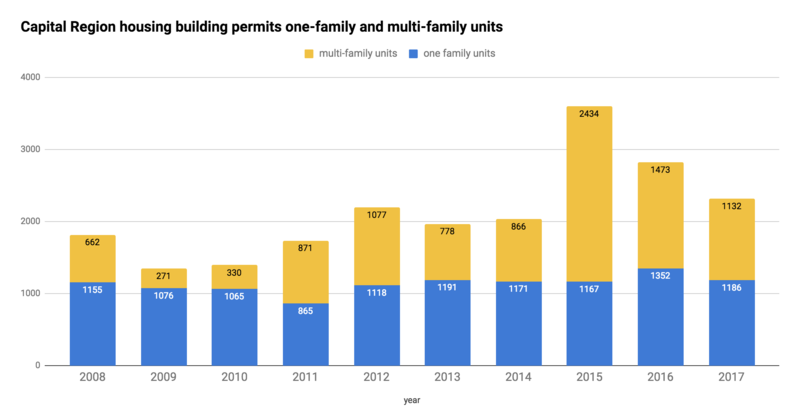 It's interesting that Albany has added more than 1,000 new residential units over the last decade, yet the Census Bureau estimates that the city's population is relatively flat since 2010 and has even been declining since 2013. But that same set of Census Bureau data also points to rising rents -- the estimated median gross rent paid in the city has risen each year, from 816 in 2010 to 875 in 2016. And the estimated number of renters paying more than $1,500 a month rose from approximately 3.6 percent of renters in 2010 (estimated 881 renters) to approximately 5.8 percent in 2016 (estimated 1,493 renters). The number of households paying 35 percent or more of household income in gross rent hovered around the 45 percent mark during that time. There are hundreds of more units -- either approved or proposed, both new construction and redeveloped -- in the pipeline for the city over the next year or two. And there appears to be plenty of demand for these new units. (Developers say they fill quickly.) So we're very curious to see how things shake out in the 2020 Census -- and what sort of effect (if any) the new apartments have on rents along the whole spectrum. The city of Albany's overall population level being flat could be the result of the loss of a ton of housing units in West Hill and in the South End. Albany has added these new units that were discussed in the article, but it's also lost a lot of old units. 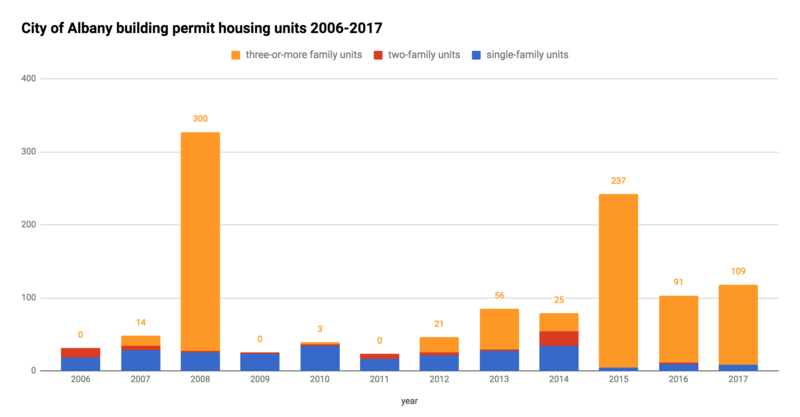 Families also keep getting smaller, so there's fewer people in each unit. Or, the population estimates just could be off.
" Families also keep getting smaller, so there's fewer people in each unit." That's what immediately came to mind to me. The 1980s and early 90s were the each-of-the-baby-boom generation, so there are a lot of mid-20s to mid-30s folks moving to their own place. Especially when a lot of them delayed moving out of home for a few years due to the Great Recession. A small whine: I wish some part of the "apartment boomlet" included (non luxury) condos...such as the buildings at the Playdium site--surely one or two the buildings could be constructed for condo ownership with the majority of the other buildings being apartments. IMO condos would attract a different market segment which could help keep the complexes stable with long term condo owners to balance out higher turnover apartment tenants, etc. Just a thought. I'm with jsc - I wish more condo development in the capital region was in the cities and not just in the burbs. I live in one of the few Albany condos right now but it would be nice to have other options. Interestingly despite the excess of apartments the prices are not dropping. Some complexes in southern Saratoga have high vacancy rates but they still charge like $1500 for 1 bedroom. The reason condos are not being built is that construction financing for condo projects is much more difficult than apartment projects. It's easier to build them as apartments and do a conversion down the line if wanted. Also agreed about condos. I'm lucky enough that my mortgage is cheaper than rent but maintaining an entire house and yard is getting old. I'd never move and waste money on rent that's higher than my mortgage, but the thought of owning a cool space downtown (or some other build site that's not in the burbs and not a generic condo development) with a washer/dryer and one parking place for under, let's say, $200,000? A girl can dream. To those looking for condo development v. apartments. The financing and approval of condo units is different from apartments. Condos also require a stronger real estate market than apartments. My wife is always wondering why 3-family historic homes in Albany seem to never be converted into condos. Is there any legal hurdle to it? Condos are really hard to make work for a number of reasons, but primarily in a market like the Capital Region's, its a financial issue. Also there are tons of rules that make it more onerous, and nobody will go through that long and expensive process just for fun without a significant payback. Even the condo market in NYC has gone down significantly. So with all that being said - with the real estate market and housing prices in an upswing, and interest in living downtown also on the rise, you'd think that this would be the perfect time for some of these developments to be made as condos, even if it means jumping through more legal hoops.